Can the right message further reduce missed appointments? Patients missing appointments is a big problem for the NHS. Called ‘DNAs – Did Not Attend’ by the NHS, they’re costly and inefficient. 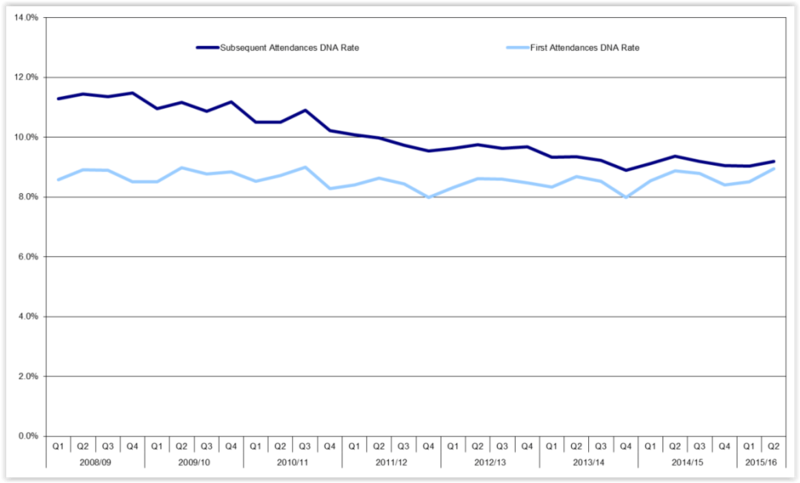 This chart illustrates the DNA rate for first appointments (light blue) and subsequent appointments (dark blue) from 2008 to 2015. Why is this data so markedly different from the use cases quoted above? Well, not every NHS Trust is utilising SMS to remind patients of their appointments, and it’s reasonable to conclude that they won’t be enjoying the drop in DNAs that Trusts and other NHS organisations who’ve deployed this technology are. 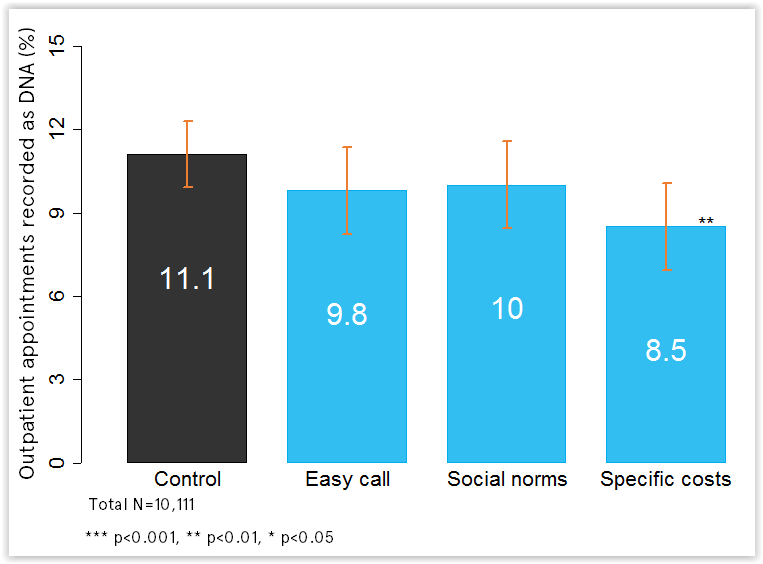 But there’s also evidence that what you write in your SMS has a dramatic impact on whether the patient will turn up for their appointment or not. A task team from the Department of Health, Imperial College London, and The Behavioural Insights Team experimented with four different messages, sent to over 20,000 patients, to see if there was any change in DNAs as a result. The ‘specific costs’ message informed the patient that their failure to attend their appointment would cost the NHS £160 – and it resulted in reducing the number of missed appointments by almost 25%. As a result, the task team deduced that if this technique was used in every NHS Trust, there’d be 400,000 fewer missed appointments every year. This evidence shows that the right message transmitted through the right medium can have a massive impact: reducing costs, empowering patients, and giving doctors and nurses more time to provide care. We supply fast and secure business SMS services to healthcare organisations in the UK, Europe and Australia. Our easy-to-implement SMS API means it’s easy to get started, but what makes us really special is our problem-solving approach. If you’re looking for ways to save costs, offer an exceptional customer experience, and improve communication, it’s definitely worth giving our team a call. Read our white paper on SMS in healthcare. Say goodbye to SMS in NHSmail and hello to Esendex!